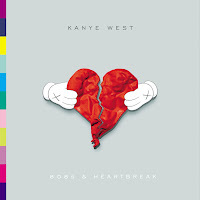 In his fourth album, Kanye West shows us how hurt he is. All the lyrics are dark, sad, depressive. Before the end, you might be tired of them. He cries a lot. After all, he lost his mother and his fiance. It's where the heartbreak came from. I feel like he needed to do this album to move on. Kanye uses the 808 drums (the same that TI and Lil Wayne used in Whatever You Like and Lollipop) to emphasize his sadness. However i think it's a good album because all the instrumentals are dope, fresh and not boring. You can clearly see his hard work and there is a lot of hits inside. You also can related to the songs. Even the "critics" unanimous, this album will do well and it's one of the best 2008 hip-hop album. It has to grow in you.